Christ Church, Frederica & St Ignatius’ Chapel, welcomes and invites everyone to join us in worship, Christian education, and fellowship. 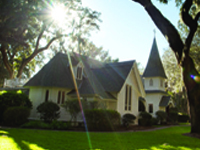 Revitalize your spirit at with one the many houses of worship on St. Simons Island and in the surrounding area. Serving all denominations, the island’s churches provide an uplifting atmosphere where you can practice your faith. You’ll discover warm and friendly congregations that will welcome you with open arms.